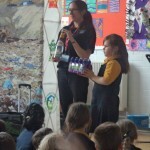 Rachel and Kirsten from NCC’s Waste Education Team visit KS1 and KS2 assemblies this week to talk about the 3 Rs – Reduce, reuse, recycle. 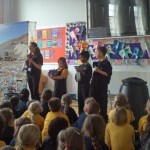 They asked children which items should go in which bin and what can be recycled or not. 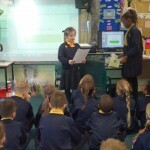 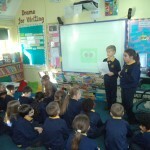 The children were very knowledgeable and all pledged to reduce waste and remind their families and teachers to do the same. 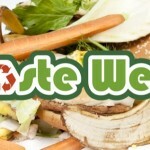 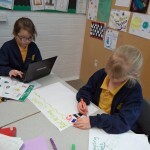 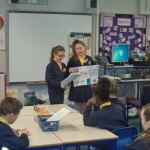 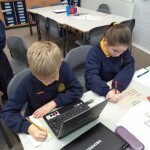 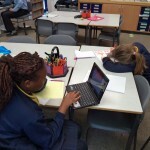 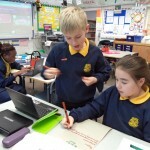 National Waste week is coming up in March and our school council have been working together to prepare presentations about the various aspects of waste, recycling and sustainable living. 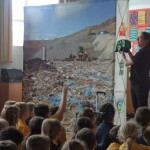 They will visit each class in the school to talk about waste types (food, clothing, toys/books/games, tins/cans/glass, paper) and how people can reduce the amount they throw away. 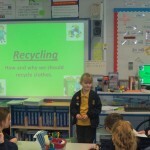 They’ll have some pretty hard hitting statistics too to convince our students why they should ‘reduce, reuse and recycle’.